What do Aussies do on Australia Day? This is a good question! I stole the title from thecookingchook and will now use it for this post. I guess people do different things on this memorial day for our great nation. However, in terms of food, Lamingtons and barbies with several beers are essential to be identified as an Aussie. Additionally, because our nation is so diverse in culture, especially food culture, people from different backgrounds have millions of ways to celebrate. Having said that, this also means many of the families from other cultures celebrate Australia day in similar manners. This is what amazing multiculturalism has brought to our nation: a diverse and unique culture in the southern hemisphere as a whole but with variations within the culture. People, no matter whether they were born in Australia or overseas, does not only adopt the unique Australian culture but also maintains their own culture. This is Australia! Anyway, I should open the topic today. Thecookingchook posted a list of things that a typical Aussie would do on Australia day. Watch the Australia Day Test cricket match on the telly (unless you are going to the match). Have Triple J’s Hottest 100 blaring from some sort of audio source (the top 100 songs of the previous year as voted by the Australian public). Wear something that has some sort of Australian reference on it (usually the flag, but the boxing kangaroo is acceptable). 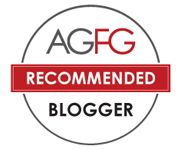 She posted a recipe on lamington and now I will post about what I had on Australia day for food, barbecue! We all know what a typical Aussie barbie is but I did not cook my steaks that way. 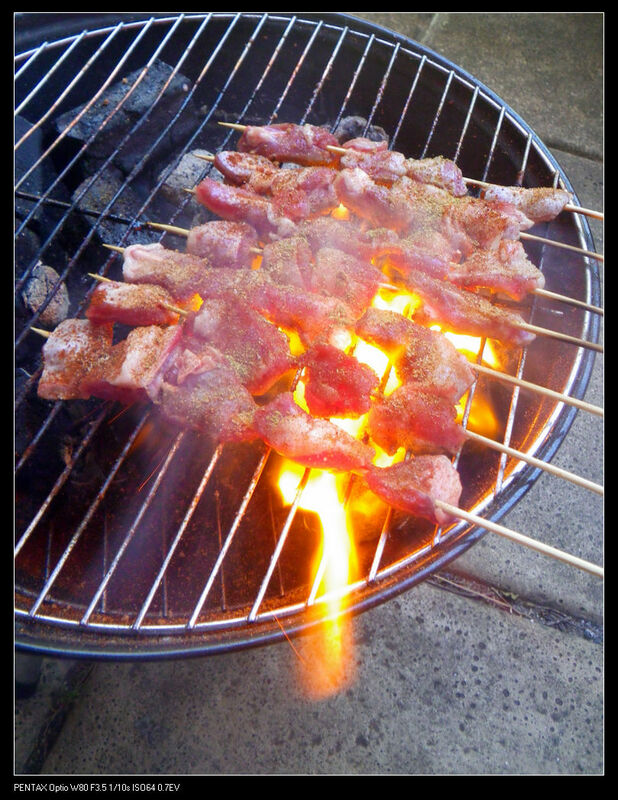 Instead, I did char grilled meat, including beef, lamb and kangaroo. The beef used were premium sirloin steaks which were cut into chunky pieces and made into kebabs. The meat was cooked medium rare and seasoned with salt. While cooking, to the meat was spreaded smoked paprika powder, salt and freshly cracked pepper. Oh, yummo! The meat was so tender with all the tasty juices well kept in the meat. The smoked paprika added extra sweet and slight chilli flavour to the meat. The barbecued beef can be eaten on its own or serve with fresh garden salad. The lamb used were meat from lamb legs. It was cut into small pieces and made skewers. 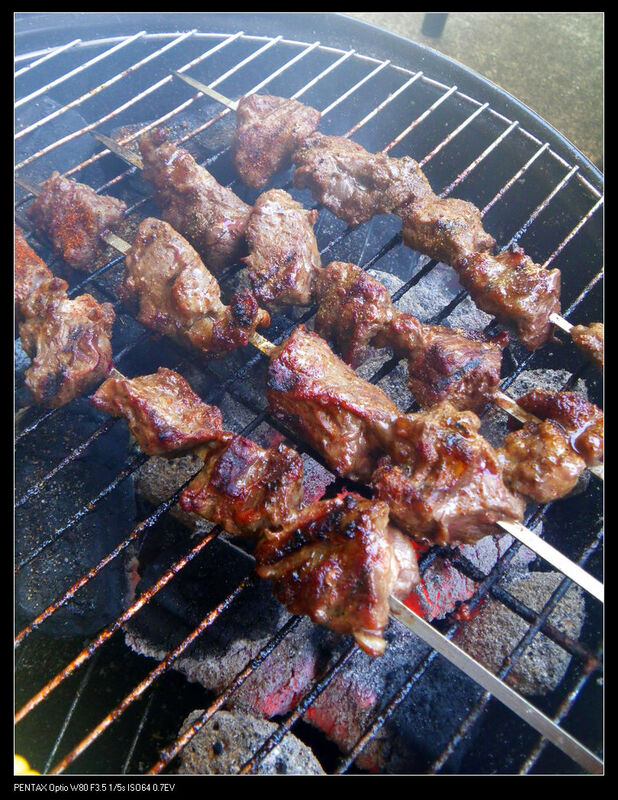 The bamboo skewers were soaked in water for 12 hrs before using to prevent burning on the grill. The lamb was just cooked well and seasoned with smoked paprika, cumin seed, salt and pepper along the way. Juicy, juicy & juicy! A barbecue on Australia day is not complete without some native Australian ingredients. Kangaroo meat is a typical and unique symbol for Aussie native produce. 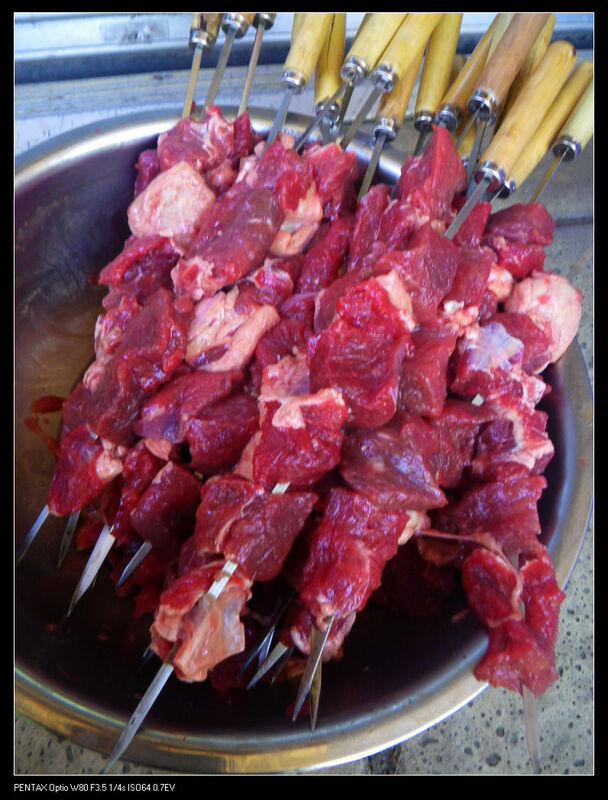 The kangaroo meat was soaked in cold water for 3 hrs until no redness on the meat. The meat showed a pale white color. It was then seasoned with salt and pepper and was soaked in a mixture of beer and Australian white wine for 1/2 hr in fridge. In this way, the game taste of the meat was kept minimal and taste full of wine flavours. I added some thyme and smoked paprika while cooking. The meat was cooked rare to prevent the toughness. I invited some of my neighbors as well as a gardener for our apartment over for tasting and I was glad they all liked it. 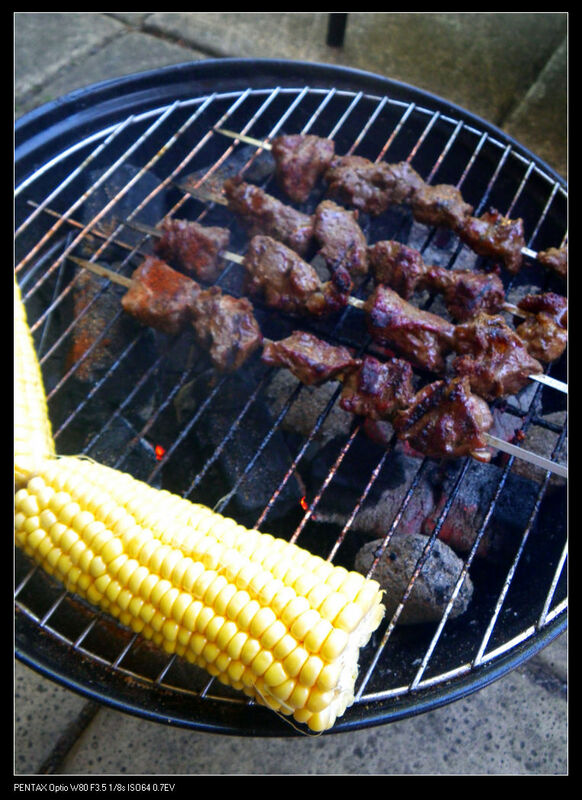 After 4 hrs barbecuing, we were full and satisfied. A trip down the Elder park for the concert and the parade made the day even wonderful. God bless Australia and hope you all enjoyed this fantastic day for our great nation! YUM! Regardless of what background you hail from, the BBQ seems to feature prominently on Australia Day. Your BBQ grub looks fantastic! At the BBQ I went to, we had two out the three animals on our cost of arms (Emu and Roo) as part of the menu plus some Italian and Asian food too. I could hear the Elder Park concert from my house – the Potbellez sounded awesome! Thanks for your generous nomination Fae! This looks like the type of bbbqing I would actually enjoy!